XL-Maxbotix-EZ line of analog sonars (XL-MaxSonar-EZ0, EZ4 and EZL0) are relatively inexpensive, short range (7m to 10m) range finder primarily designed for indoor use but which has been successfully used outdoors on Copter and Rover. These are the predecessors to I2C sonar. 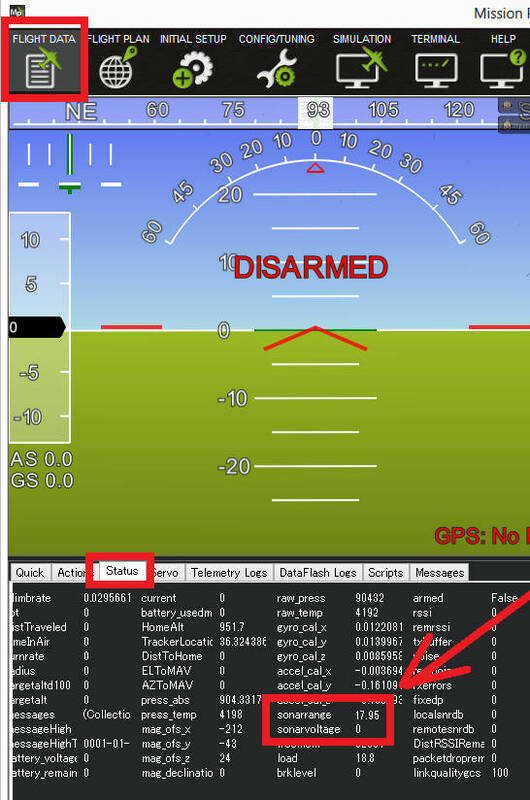 These instructions are for Copter 3.2 and later versions of Plane, Rover. Setup instructions for Copter-3.1.5 (and earlier) can be found here. The EZ4 (recommended) has the narrowest beam providing the best noise resistance while the EZ0 has the widest beam and higher sensitivity. The long range EZL0 has the same sensitivity as the EZ0 but a 10m range (as opposed to 7m). 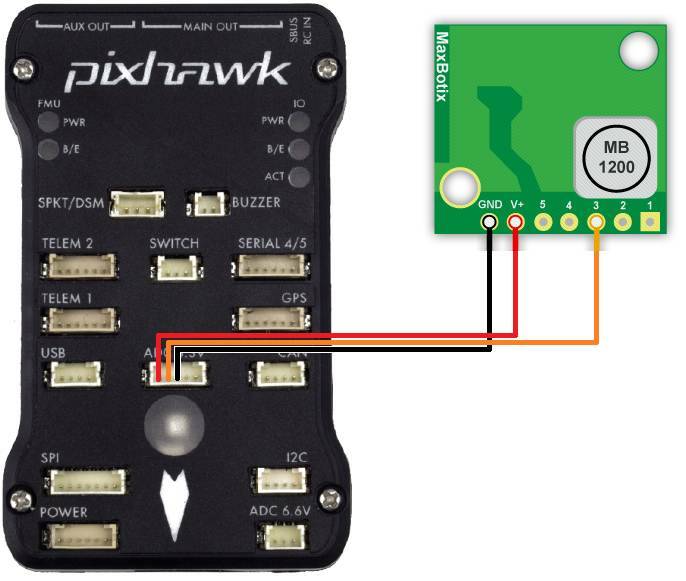 The sonar should be connected to the Pixhawk’s ADC 3.3V port as shown below. The Pixhawk will provide the regulated 5V power supply the sonar requires. The sonar should be connected to the APM’s A0 port as shown below. The APM will provide the regulated 5V power supply the sonar requires. The Maxbotix analogue rangefinders according to their data sheets output Vcc/1024 volts per centimetre, or 0.488 v/m when supplied with 5v (which the ADC 3.3v port supplies), which translates into 2.04meters per volt. The range is 7.6m according to the datasheet, but analog output is limited to 7m. As we can only read up to 3.3v then that means 6.75m is the furthest it can really measure.